Oh the joy. I am half way to a Granny's garden. I have now made 111 flowers. 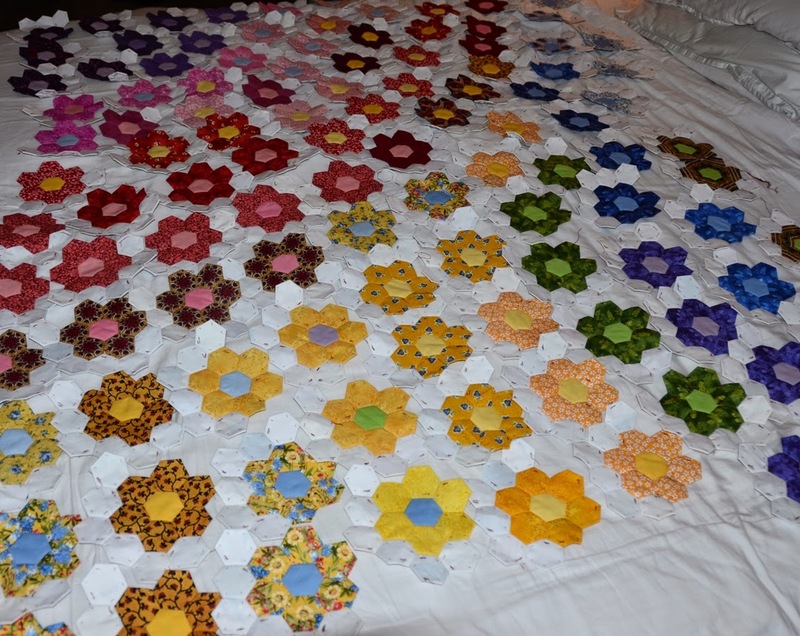 I scattered them on the bed and realised that I really need to check to see if I really need 221 flowers. I have a bad habit of making more of repeat objects than I need to. 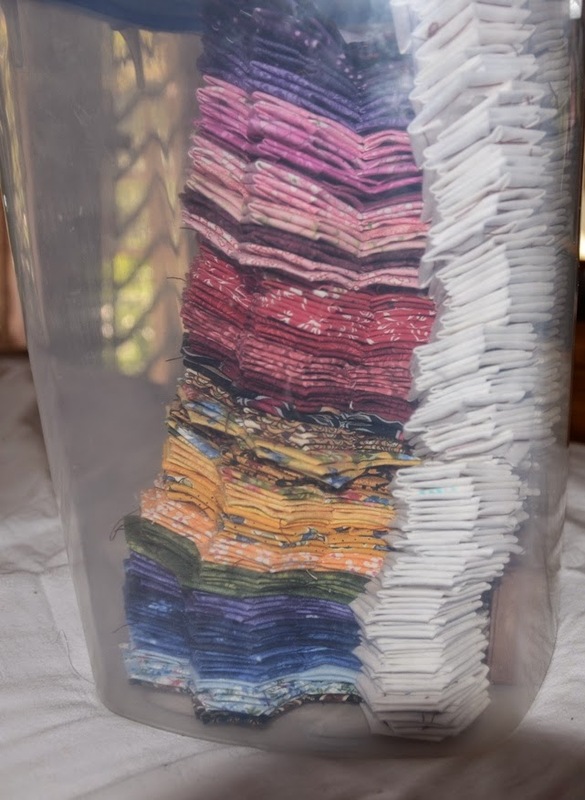 I have a whole tub of parts of a future quilt. Possible I will have enough to make a quilt to cover my car. My car is all better. The coils or something had blown and that is why my card had lost it's putter and instead was doing the splutter. I scan each of the flowers as I make them so that I can add them to the Granny's garden tab. Maybe silly, but I think it is fun. I had 6 flowers that I had not as yet thrown into the flower bucket. These six flowers were in a pile on the desk. The cat found them and this is her attempt at testing the new quilt. I actually think cats prefer quilts being made to boxes. We all know how much any feline loves a box to sit in. Hope that the weather is amazing where you are. I love spring and Autumn. The temperature is at a perfect level and either you see lovely new growth or the trees are putting on a magnificent show. Hope you have a stunning day. Great looking flower garden. I have one on the go too. Those are gorgeous! I have one in process and I need to start thinking of what color to use to join them.... I'm thinking something dark. Enjoy your stitching. 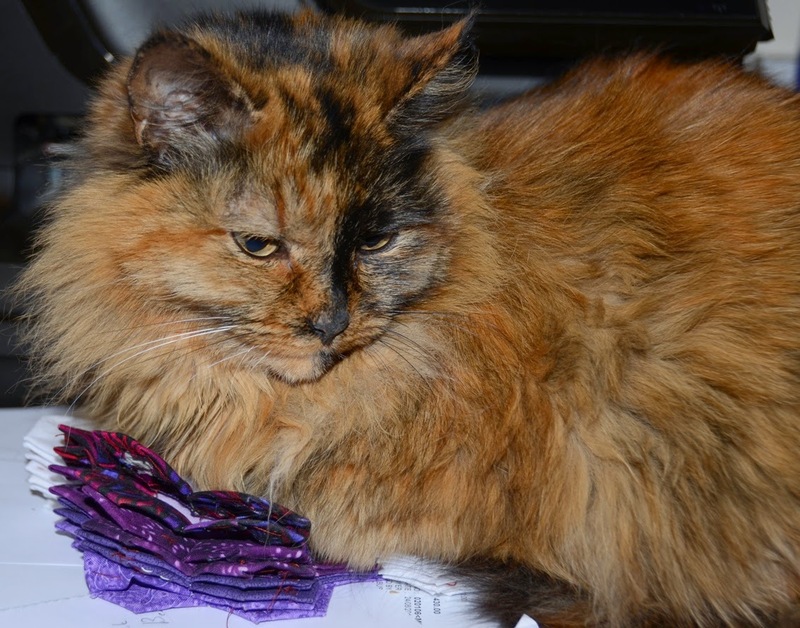 All my quilts and blocks in process are cat tested and approved.